Following a run at the Pleasance Theatre, Islington in 2014 and two sell-out runs at the Edinburgh Fringe Festival, the acclaimed stage adaptation of Dr Seuss’s The Cat In The Hat will return to London this festive season from Tuesday 6 December 2016 to Monday 2 January 2017. On sale now. There will be press performances on Friday 9 December at 10.30am and 1.30pm, and Saturday 10 December at 11.00am and 2.00pm. From the moment his tall, red-and-white-striped hat appears around the door, Sally and her brother know that the cat in the hat is the funniest, most mischievous cat they have ever met. With the trickiest of tricks and craziest of ideas, he turns a rainy afternoon into an amazing adventure. But what will mum find when she gets home? Based on the much-loved book by Dr Seuss that has captivated generations of readers, The Cat in the Hat is a lively and engaging first theatre experience for young children aged 3+. The Cat in the Hat is presented by Paul Taylor-Mills, who recently became Artistic Director of St. James Theatre, which will be relaunched as The Other Palace in February. Paul’s recent productions include the Olivier Award-winning In The Heights (King’s Cross Theatre), The Last Five Years (St. James Theatre), Side Show (Southwark Playhouse) and Carrie: The Musical(Southwark Playhouse, winner of the 2016 WhatsOnStage Award for Best Off West End Production). 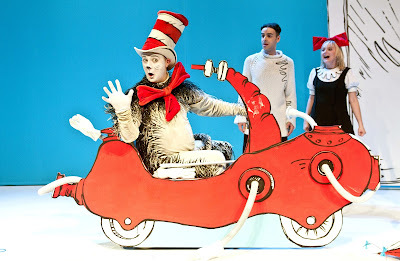 Dr Seuss’s The Cat In The Hat, based on the book by Dr. Seuss, was originally produced in 2009 by the National Theatre of Great Britain, and adapted and originally directed by Katie Mitchell. This production is directed by Lillie Collier and designed by David Shields. It is presented through special arrangement with Josef Weinberger Plays Ltd on behalf of Music Theatre International (MTI).